I love it how this bold color makes our whole personality pop out with those luscious lips making the boldest of statements for you! We ladies have a soft spot for that red lipstick in all our hearts and we are totally blown away by the fact that it holds the power to completely transform our overall personality. But, let’s not forget that there are some rules that need to be followed here before you apply that red lipstick on your luscious lips. 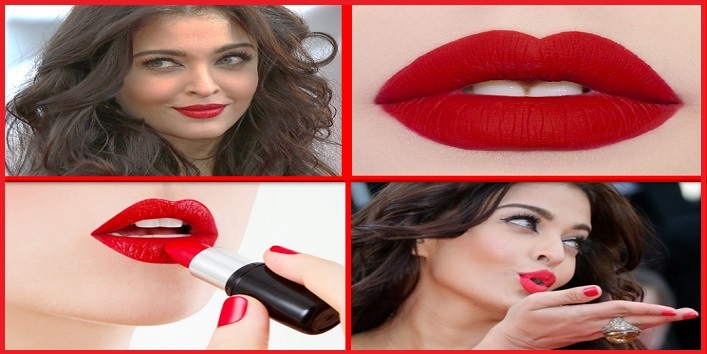 The red lipstick has eventually evolved as a staple color for every Indian girl’s makeup wardrobe. And the best part about it is, it totally enhances your personality and looks, and blends in perfectly on that beautiful Indian skin. So, let’s take a look at the rules that you must follow before making your lips bleeding red. There are tons of shades even under the red lipstick category alone. And it’s important that you know which shades goes along with your skin tone well. women with fair skin tone must go with the original red shade with no hint or orange in it, whereas women with dusky skin tone must go with red shades with the orange or pinkish tone in them. Wine or purple-red suits best on the dark skin tone. Before you apply that red lipstick, it is important that you refresh them and scrap off any dead skin that can ruin the chances of getting a perfect look. Flaky looks can destroy the best of your looks and make you look dull. Use a scrub or sugar granules to get rid of that flaky lips. Ladies, always keep one thing in mind, lip liners are never outdated! In fact, it is them who amplifies the boldness of your lipstick. Wear a lip liner of the same shade as your lipstick that will enhance the look and allow it to prevent from melting the lipstick away. This is the most important thing that you need to keep in mind while wearing a red lipstick, it is essential that you keep your makeup to the bare minimum. Or you can either keep it light and warm as well. if you did wear too much makeup with red lipstick, that will only end up in some ‘fashion disaster’ rather than the statement. Red itself say bold and beautiful, so you didn’t need to experiment by adding glitter or shimmer to it. Matte red lipstick looks the best on any skin tone and outfit. And carries your personality along with itself. Matte lipsticks are always rich in color and texture in comparison to the glossy ones. And the best hack to turn your glossy red lipstick into matte is to dab on some baby powder at last. That will surely do the trick! The red lipstick speaks for itself and it doesn’t need another makeup part to enhance your entire personality all at one. Try to keep the eye and face makeup to the minimum. And if you want, you can apply petroleum jelly on your eyelashes and eyelids to add a natural shine to them. The best shades of dresses to go with the bold red lipsticks are monochromes, black, pastels and completely white. But it goes well with lehengas and evening gowns as well. Remember not to wear red lipstick with funky or animal print outfits. Play clean and look bold. How embarrassing would it be to have stained teeth, especially from the red lipstick? Very much, yes! So, it is important that you use a blotting paper to help you get rid of that excess lipstick from your lips. Or else, put a finger in your mouth and then close your lips. Pull out your finger and the excess lipstick will come out along with it. Always remember to use a lip primer or foundation before applying the red lipstick, that will allow it to prevent pigmentation and last longer on your lips. Brush lightly with a compact or baby powder after the final coat too. Now that you know the ‘secret’ to that perfectly bold red look for your lips, then what are you waiting for! Go ahead and try to flaunt it with the best matching outfits. Share your tips and comments with us and tell us how we can improve it further.